Cycle Tramps | Travelling on a budget! We’re on our way! Find out what we’re doing by looking at our blog posts. What, or who, are Cycle Tramps? Cycle Tramps are two tight fisted individuals from the North of England who think that cycling doesn’t have to cost a lot of money. In June 2013 we plan to embark on a cycling tour of Europe. It’s less of a cycling holiday, more of a means of circumnavigating Europe very cheaply and not missing all the bits in-between. And yes, cheap is the aim of the game; we will be travelling around 3,000 miles in 4 or 5 months on bikes built for less than a couple of hundred pounds each, using budget and used parts bought on ebay and such like. Cycle touring? Isn’t getting wrapped up in lycra and cycling all day really un-cool? Yes, very. Lycra is only really worth it if you’re chasing that extra tenth of a second round a velodrome. If you’re a 42 year old MAMIL (middle aged man in lycra), those £120 shorts and that £6,000 road bike aren’t going to make you Chris Hoy (you could look like Victoria Pendleton but that would involve spending £6k on some plastic surgery and a trip to Thailand…). So what’s the point of this blog, again? The purpose of this blog is to share our build up and eventual journey around Europe that, as yet, has no definite end. We also hope to share tips and guides about how you can build your own bike on a budget, plus other stuff like how to sniff out a good deal on the internet! Sorry, I wasn’t paying attention. Who are you again? The cycle tramps are Nev and Neola. Neola is a retired Lawyer and at 31 she’s probably the youngest retiree you’ll ever meet and definitely the only one that retired because she “didn’t want a real job”. 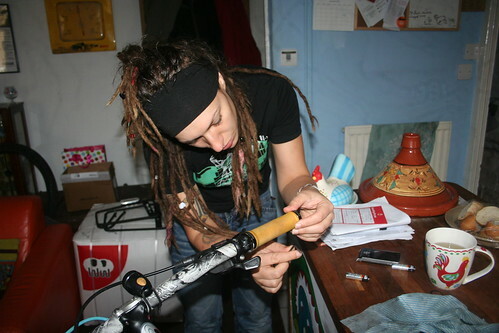 She’s only recently become interested in cycling but don’t be put off by the dreadlocks; she’s not a hippy and does wash. Read more about Neo here in her bio. Nev is a jack of all trades, master of none. Like all real boys, he likes to take things apart and put them back together again. Sometimes, they even work afterwards! He took up cycling about 2 years ago as a commuter to work and hasn’t looked back since. Despite having just finished building a car, a bike is still his main mode of transport. Read more about Nev here in his bio. Welcome to our world. Let the bike be the means not the reason. Thanks Pcyklist 🙂 Your comment sums our sentiments up exactly! Can’t wait to get going – not long now! Cheers dude. More updates coming shortly, just taking her apart now- an entire winter cycling on salty, snowy roads really takes its toll! That would be amazing! Thank you so much 🙂 Retirement from the real world is definitely the way forward!!! I do have to admit, I have taken great joy in the past cycling in to work, dressed in a suit and on my 20+ year old mountain bike, passing lycra clad men on road bikes. YEAH! Hi guys, it was an inspiring (and long!) trip with you today. Really enjoyed meeting you and hearing some of the stories first hand. Keep on tramping and stay safe. Cheers dude, it was indeed a long trip! It was great to meet you and in the excitement of arriving in Budapest we forgot to invite you out for a beer or two. We’ve sent you a message on your blog.